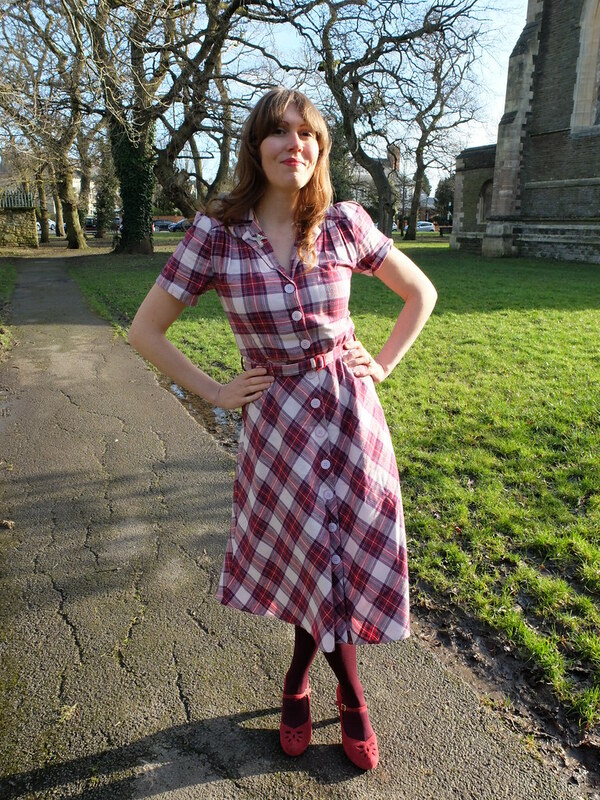 I've already mentioned British vintage reproduction clothing company The Seamstress of Bloomsbury a few times on this blog, so it's with great pleasure that I share this review of their 1940s style 'Lisa' dress. I visited their stand at the London Edge show, and was most impressed with the quality and authenticity of their designs, down to the 'feels like vintage' fabrics and some stunning new designs. 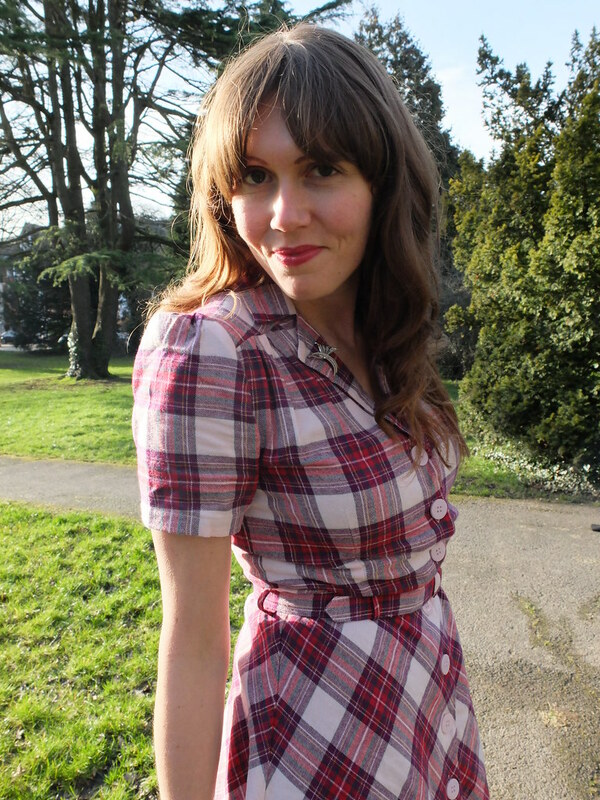 You might remember the Lisa dress from my post on 1940s wedding dress inspiration, where I shared a snap of it in pure white cotton, but it's the colourful tartan in pinks and purples that I'm showing you today, in a cosy brushed cotton fabric. Hair: Waved using Nicky Clarke Hot Bendy Sticks! The Seamstress of Bloomsbury is a brand specialising in clothing in a 1940s style, with all of their garments based on original patterns that were once made by Miss Lillian Wells, who was the original seamstress back in the 1940s. The fit was great - I'm normally a size 12 in most brands and so went for a 12 in this one. Across the shoulders and the back it fit neatly, and the waist is rather loose, with the belt to cinch it in and give the dress its shape. I'm 5'9" and the length is lovely, fitting nicely below the knee. I have to say just how comfy this dress is, not just because of the roominess in the waist, but also because the brushed cotton fabric made me feel a bit like being in my pyjamas. The cosy fabric was certainly welcome on a somewhat fresh late Winter's day, and I did rush to put my coat back on after these photographs were taken! I love this dress. But what you'd really like to know is, is it worth the money? Yes. Yes. Yes. 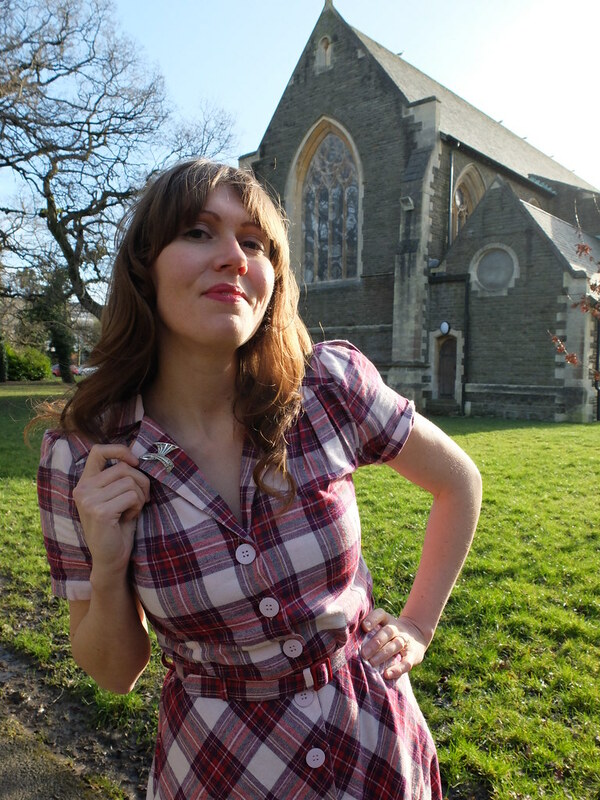 I have a few items of vintage repro in my wardrobe that I have paid above average for, from brands like Tara Starlet, Vivien of Holloway, and 20th Century Foxy, and they have all been worthwhile investments that I have worn time and time again, and the quality has really been great in comparison to some cheaper vintage repro brands where sometimes you strike it lucky but on other occasions it can be more hit and miss. 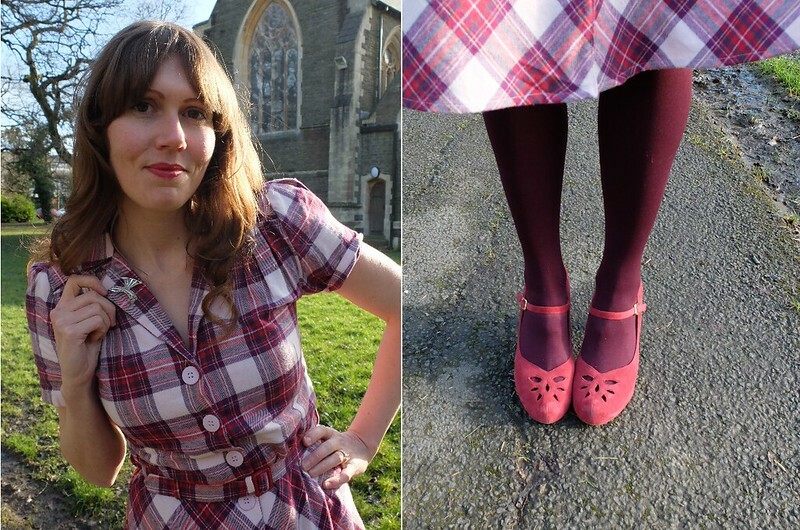 I know the best part of £80 is a lot of money for a dress, but if you want a 1940's style dress that is trans-seasonal, this one's a really good choice. I layered up underneath with a slip and thick tights, but in Spring you could probably just throw a cardigan on top. It's got a collar, so a jumper would also look nice over it in Winter. My other half thinks it looks a bit Western, so I might try it with cowboy boots one day. I can't wait to share the other goodies from The Seamstress of Bloomsbury, but all in good time! If you want to see more about Seamstress of Bloomsbury clothing, I featured their headscarf here after I won it in a competition. I was generously gifted this dress for review and given a discount on the other items I purchased. All words and opinions are my own. The dress is absolutely smashing - and it suits you so well. Have an amazing Sunday, darling! LOVE this dress on you! It looks like it was tailored for you. The shoes and the tights are great too. Brilliant outfit! Ooh that looks like one of those crackin combos - super cosy, and super stylish! Looks lovly paired with the tights and shoes,and will also look great paired with cowboy boots. Gorgeous dress - and the shoes are so cute! This dress is darling! And looks fabulous on you! Thanks for sharing yet another vintage repro brand! I have been feeling a need to expand into more brands. I am just so afraid! Also your shoes are too cute! That dress looks lovely on you, shows off your cracking bod a treat. Your shoes and tights are the perfect complement to that dress! Beautiful and so authentic vintage (without the worries!). I think you chose very well. Thanks for sharing with Visible Monday, xo. Ah, that's good to know. I do appreciate that larger sizes are tricky - we mostly have the same basic skeleton, but the more padding you put on it, the more variation in shape there seems to be. I know I'm a very different shape to some other plus-size bloggers. Can't be fun having a clothing firm and having to factor all that in! You could dance in it, but there are other dresses on their site such as the Viloet, that are much more suited to dancing, with very swingy skirts! 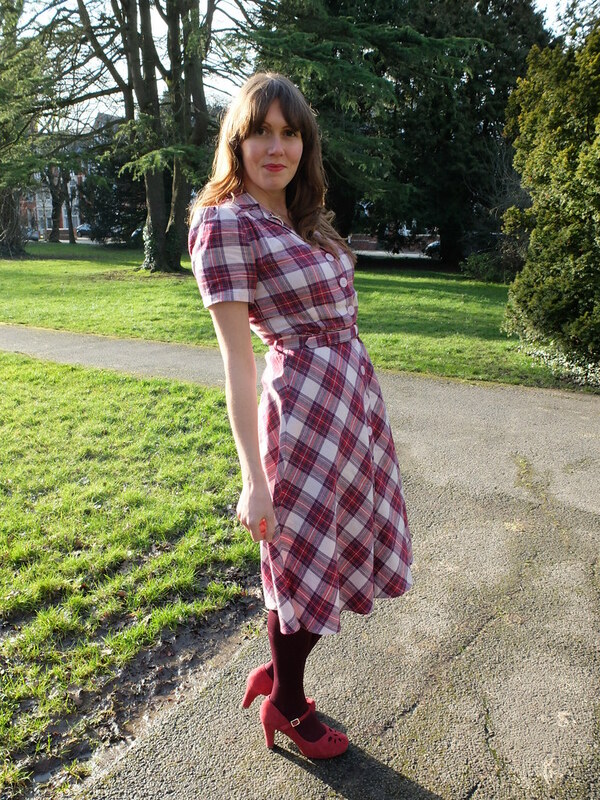 You can see how positively in love with, and also comfortable while wearing, this splendid plaid repro frock you are. it's such a charming, timelessly pretty garment. I'd sport it in a heartbeat, too! I keep hearing more and more about this brand hope that they continue to grow and perhaps even start be carried some Canadian stockists. Thank you for the great review. You look gorgeous, dear gal! it's one of those brands that has fantastic quality and designs, because the people behind it have a real passion for vintage (and are really lovely). They deserve to do really well and I'm proud to support them on this blog. What a fun look! Love where you took these pictures too! Visiting from What I Wore Wednesday! I love the dress, and those shoes! Adorable! I use to have a tartan plaid skirt that featured the same colors as the dress. Thanks for the visit Stephanie, I'll swing by your blog in a bit! Great colours aren't they? Can see why they're a popular choice in tartan. Sounds like a neat company. Love the colors in your plaid dress and the style is lovely. Especially love the shoes with it. I love the dress--especially that fantastic tartan! The way you paired it with the tights and shoes is so great! I'll have to borrow that tone-on-tone trick! This dress is gorgeous on you and shows off your tiny waist so well. Thank you for joining TBT Fashion link up and hope to see you Thursday. What an amazingly cute dress! I love the cut, colors, and tartan print! I love it on you!